I won't spoil the surprise of the myriad insights waiting within the extras, but rest assured that the Mick Jackson and Karen Meagher commentaries will bring a whole new dimension of understanding to Threads. For now, though, lets take a closer look at the film. Although the British public were well aware that relations between the USA and Russia had reached an all time low, they were unaware, in 1984, just how close the world had come to nuclear war in the previous five years. With incidents such as the Norad Glitch, Stanislav Petrov's well-judged false alarm and the Able Archer exercise taking the world to the brink of a nuclear catastrophe, the truth behind any sense of nuclear deterrence was wearing painfully thin. Two decades earlier in 1965, the BBC had produced The War Game which examined the effects of a nuclear attack on Britain. However, it was never transmitted at the time due to BBC fears that it was too horrific. Top brass at the BBC were so concerned by the film's content that they genuinely believed that it could lead to suicides. 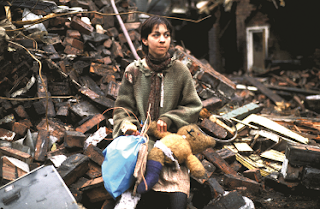 With a whole host of cultural and societal changes taking place since the 1960s, Alasdair Milne - BBC Director General - decided that it was time to tap into contemporary nuclear anxiety and Threads was born. Written by Barry Hines - best known for 'A Kestrel for a Knave' which was later adapted into Kes - Threads was directed by Mick Jackson. Now, Jackson came fully loaded with not just a camera, but also a nuclear pedigree. Only two years before, Jackson had written and produced BBC1's QED: A Guide to Armageddon. Concentrating on the aftermath of a nuclear bomb detonating above London, A Guide to Armageddon brought a brutal realism to the threat of nuclear war. Threads, however, would prove to be unlike anything seen before or since. Society runs on a strict regime of structure and rules. Without order, society would collapse and anarchy would reign. Barry Hines knows this and that's why, in Threads, he pushes this fragile state of compliance to breaking point. Hines doesn't just stop there; he systematically snaps every sinew in its twitching frame before exposing it to a downpour of uranium and plutonium. And he does it all with the grim brand of realism that had empowered his novels 'A Kestrel for a Knave' and 'Looks and Smiles'. Never wanting to succumb to a glossy, idealised struggle, Hines resolutely ensures that stylised heroism is kept as far away from Threads as possible. 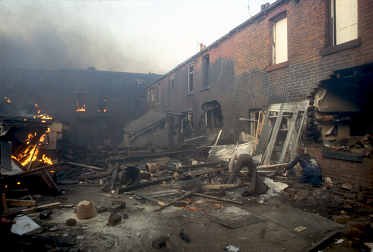 This, after all, isn't Hollywood, it's the terraced streets of 1980s Sheffield, a city caught up in strikes and economic hardships. 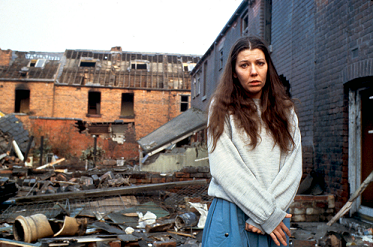 Despite this landscape, Hines concentrates his tale around a figure who is in stark contrast to the society around her. With a baby on the way, Ruth Beckett embodies the future, but it's one where toxic mushroom clouds threaten to envelop all sense of hope. 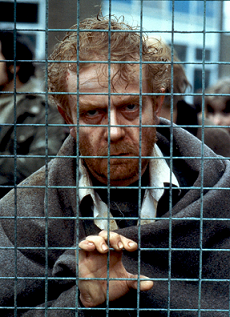 Initially bearing all the hallmarks of a kitchen sink drama, Threads begins with the blossoming relationship between Ruth and her partner Jimmy Kemp (Reece Dinsdale) hitting an unexpected road bump in the form of an unplanned pregnancy. While our young protagonists arrange, as society dictates, a marriage, matters of a much greater magnitude are bubbling away in the background. Glimpsed news reports reveal that a deepening military crisis in the Middle East is bringing American and Soviet relations to a dangerous low. Evidence of a shift in global stability gradually begins to seep into Ruth and Jimmy's lives; the news brings nothing but escalating tensions and, in Sheffield, a massive redeployment of military resources is taking place. Life, of course, goes on for Ruth and Jimmy as they endeavour to decorate their flat and build a nest for their forthcoming child, but the very definition of what constitutes a home will soon be rewritten. A new, nuclear dawn soon arrives as all out nuclear war breaks out between the Americans and the Soviets. 3,000 megatons worth of nuclear weapons are exchanged between the two superpowers, with 210 megatons falling on the UK. The effects are devastating with every infrastructure in the country being reduced to a scorched shadow of its former self. An emergency response team, holed up deep beneath the remains of Sheffield town hall, attempt to exert relief, but they're thwarted at every turn by dwindling supplies and radioactive fallout. Against a backdrop of radiation sickness, martial law and the harsh realities of living in amongst ruined buildings, Ruth struggles to find any sense of control or sanctity. Heavily pregnant, Ruth - now separated from Jimmy - symbolises the antithesis of everything that this harsh new world represents. Giving birth to her daughter Jane (Victoria O'Keefe) in an abandoned barn, Ruth must now cope with raising a child in a world where harvests are crippled, technology is non-existent and rats form the national diet. 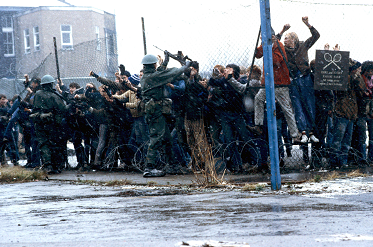 It's a truly horrifying narrative that Barry Hines imbues with a power and gritty realism which refuses to relent. Much like the heartbreaking death of the kestrel in 'A Kestrel for a Knave', Hines refuses to bow down to sentimentality. Instead, he crafts a cracked new world where even recognisable language amongst the young has been replaced with a rough, feral approximation of syllables. And as evidenced by Jane's nonchalant reaction to her mother's death, emotions no longer feel like a worthwhile currency. Crucial themes such as society's dependence on conformity are thrust to the forefront and almost all of the deeper horror in Threads comes from the barbarism of a broken, mangled society. It's a damaged Britain which has, in part, received a significant sucker punch from the abysmal civil defence response and acts as a damning indictment of political responsibility. Crippling Britain's recovery even further is mankind's dependence on technology; with electricity and medical supplies non-existent, the country descends back into the dark ages. While Hines script is incredibly powerful, Mick Jackson's direction takes the narrative and magnifies it almost exponentially thanks to the terrifying visuals. A Guide for Armageddon certainly contained some chilling sights, but, in Threads, Jackson truly ratchets up the visual fear. Charred corpses litter the streets (and trees), shell-shocked mothers cradle their dead children and Ruth is forced to feast upon the raw, contaminated corpse of a sheep. With an abandoned Hillsborough estate turned over to the production, Jackson is also granted the opportunity to subvert the the sanctity of the family home. Where once there was love and community, there now remains nothing but piles of rubble full of rats and disease. And it's this sharp, sudden detachment from reality which makes watching Threads such a numbing experience. Again and again, Ruth, the innocent citizen that represents us all, is bludgeoned by the harsh realities around her. Every inch of Threads is infected with a crushing sense of helplessness and it's this that upsets the most. However, much as Ruth continues to stagger onwards, you can't help but keep watching. To say it blunts your soul would be an understatement; I genuinely think that Threads rewires something deep inside of you to cope. In the face of all this depravity and destruction there is, believe it or not, time for humour and, whisper it, hope. The humour occurs only sporadically, but it's there. Shortly after the nuclear attack, a soldier shoots a looter dead and discovers a pack of crisps on the body. The soldier's joy at finding the snack soon turns sour, though, as he discovers they're prawn cocktail. A trifling indignity in the grand scheme of things, but a hilarious reminder of our priorities. Much later, more laughs abound as Ruth haggles with a street vendor for dead rats and, in a deliciously cruel visual gag, loads them into a Gateway shopping bag with the tag line 'Good Food'. In even shorter supply is hope. Although society's foundations have well and truly been destroyed, there's a concerted effort to pull together and rebuild. A scene towards the end of the film finds Jane undergoing a crude form of education - one of the cornerstones of society - and, later, she unravels old threads so that something new can be created. There's even time, just before the final scene turns your stomach, for some sentimentality; as Ruth dies - 13 years on from the attacks - it's revealed that she's been carrying, for all this time, one of Jimmy's beloved books on birds. 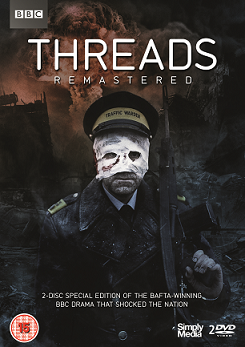 Completely uncategorisable due to its kaleidoscopic range, Threads is a masterpiece of British television. Like all the very best art, Threads challenges conventions, induces extreme emotions and delivers a truly unique experience. And, as long as nuclear weapons remain a reality, Threads will never lose any of its explosive power. A brilliant read, Ben. I had no idea that a special edition DVD was available - am sorely tempted to update from my previous release now, even though Threads is something that doesn't bear to be seen too frequently....you'd be heading for a breakdown if you did! Truly brilliant, landmark television though. It was Threads that led to me joining the CND and I firmly believe everyone should watch it, at least once. It should be on the school curriculum in fact. You know, I probably watch it once a year. Maybe it's a little sadistic to put myself through it, but it's just too good to resist! I have just bought the Blu-ray version. My kids know of it but have refused to watch it. I softened them up with when the wind blows. 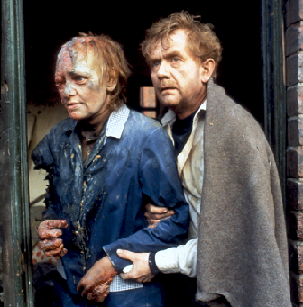 'Threads' was looked on as left-wing anti-nuclear propaganda in the mid-80's during the height of Thatcherism,yet was still broadcast by the BBC even though said Mrs T always clearly had a downer on the organisation. Three decades on,the current social/political way of thinking has veered even more to the right,and the Beeb nowadays wouldn't dare to even consider commissioning such a drama as this,as fluffy escapism such as Bake-Off or Strictly carefully placate the masses into artificial cheerfulness instead of bleakly apocalyptic grimness.Having said that,virtually all modern TV makes me feel apocalyptically miserable anyway,so if an equivalent of 'Threads' was broadcast,I doubt my mood for one would be much changed,anyway. Absolutely. The BBC had balls then, now the supposedly impartial broadcaster wouldn't dare upset the government or tell the public what's what. Is it any wonder the latest generation is turning to the net for entertainment and for news?